Constructor takes a FitsFile object. Targets are the data columns corresponding to the WCS derived quantities. Fill up the data columns for the ten WCS derived quantities. Implements method to determine a number of attributes that are calculated from WCS information encoded in FITS files. This is tailored to the ten WCS derived quantities in the "CurrentAstrometry" table. These quantities are: the central RA and DEC, the position angle of the x-axis, the angular extent of the image, the pixel scale in the x and y axes, and the maximal and minimal values of RA and DEC,resp. References Logger::addError(), TableData< DataType >::assign(), DataOps::calcAngsep(), DataOps::calcPixSize(), FitsFile::CRVAL1, FitsFile::CRVAL2, QuantitiesByAst< DataType >::decColno, QuantitiesByAst< DataType >::decFact, QuantitiesByAst< DataType >::extentColno, QuantitiesByAst< DataType >::extentFact, ExpectNames::extNum, QuantitiesByAst< DataType >::extnumColno, FitsFile::getFileName(), FitsFile::getNumCards(), FitsFile::getNumHdus(), FitsFile::hasKey(), ExpectNames::imageExtent, QuantitiesByAst< DataType >::log, QuantitiesByAst< DataType >::maxDecColno, QuantitiesByAst< DataType >::maxDecFact, QuantitiesByAst< DataType >::maxRaColno, QuantitiesByAst< DataType >::maxRaFact, QuantitiesByAst< DataType >::mFile, QuantitiesByAst< DataType >::minDecColno, QuantitiesByAst< DataType >::minDecFact, QuantitiesByAst< DataType >::minRaColno, QuantitiesByAst< DataType >::minRaFact, FitsFile::movabsHdu(), FitsFile::NAXIS1, FitsFile::NAXIS2, QuantitiesByAst< DataType >::posangColno, QuantitiesByAst< DataType >::posangFact, QuantitiesByAst< DataType >::raColno, QuantitiesByAst< DataType >::raFact, FitsFile::readCard(), FitsFile::readKey(), TableData< DataType >::value(), ExpectNames::xPixSize, QuantitiesByAst< DataType >::xsizeColno, QuantitiesByAst< DataType >::xsizeFact, ExpectNames::yPixSize, QuantitiesByAst< DataType >::ysizeColno, QuantitiesByAst< DataType >::ysizeFact, FitsFile::ZNAXIS1, and FitsFile::ZNAXIS2. 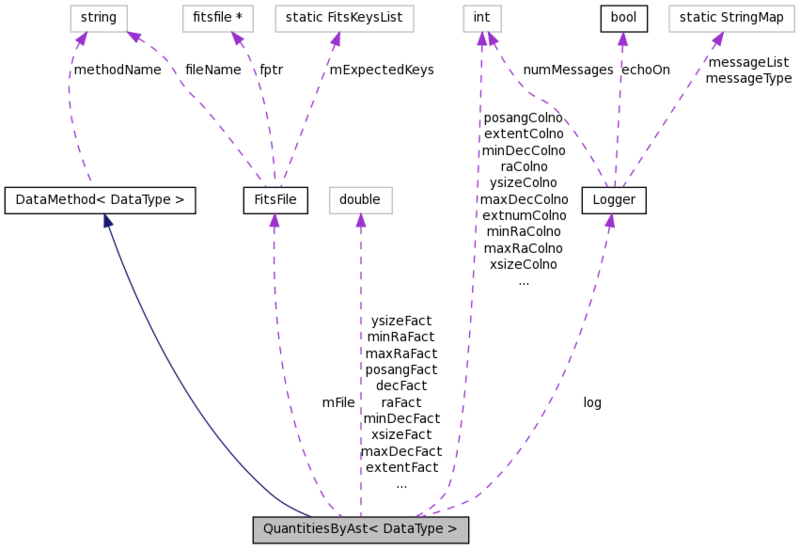 References QuantitiesByAst< DataType >::decColno, QuantitiesByAst< DataType >::decFact, QuantitiesByAst< DataType >::extentColno, QuantitiesByAst< DataType >::extentFact, Converter::getFactor(), QuantitiesByAst< DataType >::maxDecColno, QuantitiesByAst< DataType >::maxDecFact, QuantitiesByAst< DataType >::maxRaColno, QuantitiesByAst< DataType >::maxRaFact, QuantitiesByAst< DataType >::minDecColno, QuantitiesByAst< DataType >::minDecFact, QuantitiesByAst< DataType >::minRaColno, QuantitiesByAst< DataType >::minRaFact, QuantitiesByAst< DataType >::posangColno, QuantitiesByAst< DataType >::posangFact, QuantitiesByAst< DataType >::raColno, QuantitiesByAst< DataType >::raFact, QuantitiesByAst< DataType >::xsizeColno, QuantitiesByAst< DataType >::xsizeFact, QuantitiesByAst< DataType >::ysizeColno, and QuantitiesByAst< DataType >::ysizeFact. Referenced by QuantitiesByAst< DataType >::doit(), and QuantitiesByAst< DataType >::setTarget(). Referenced by QuantitiesByAst< DataType >::doit(), and QuantitiesByAst< DataType >::setSource(). Referenced by QuantitiesByAst< DataType >::doit().